Having read the results of the McCain survey which revealed that one in five children aged between 7 and 11 do not know that potatoes grow in the ground, I have decided to write a series of posts with ideas on how to teach your toddler the origins of food. We are very lucky that we have a garden large enough to contain raised beds where we grow our own vegetables. Our Little Garden Helpers are in the garden most days helping us plant, dig and harvest a variety of vegetables and as a result they are in no doubt as to where their food comes from. But not everyone has a garden. These Friday tips therefore are aimed at everyone, with or without a garden. Put on your woolly hat, wellies and warm coat and head outside for a walk, keeping your eyes open for fruits, nuts and edible leaves. There are lots to find, all year round, if you really look for them. Even in the cities, just head for a large park and there will be food for picking. You have probably all been blackberry picking at some point and there might still be a few late ripening berries out there now, but the best thing at this time of year are the Sweet Chestnuts. Your toddler will love throwing sticks high into the trees to try and knock the prickly round cases onto the floor and then will have even more fun stamping on the prickly balls (with thick boots of course) to crack them open and reveal two or three sweet chesnuts hidden inside. Just make sure they wear thick gloves so they don't prick their fingers. Let them eat some raw there and then, a great reward for all their hard work but make sure they fill their backpacks with lots to take home for roasting. If you are brave enough there are lots of fungi growing at this time of year and with the wierd and wonderful array of colours and shapes these are fascinating for toddlers. I must confess that I am not brave enough to pick wild mushrooms just in case I get the identification wrong and I poison my whole family, but we still look out for them when we are walking and both my Garden Helpers love looking at the strange formations. I always tell them that the mushrooms we buy at the supermarket once grew under a tree just like the ones we see when we are out, but that some varieties can make people feel sick so it best to let experts pick them. I am also always telling them both not to pick and eat enything unless they have checked with me first just to make sure they won't get a sore tummy. 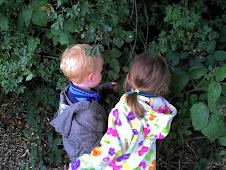 The best thing about foraging for food is that its free; both the food and the day out. And while they are having fun your toddlers will be learning how things grow. Once you have started foraging you will always be on the look out and there is more out there than you might have thought. If you think you might want to give it a go there is a brilliant little pocket sized book called Food for Free by Richard Mabey (ISBN 9870007183036) which will help you identify edible plants, trees and fungi, as well as having a handy list of what to look out for each month. We take this with us whenever we go for a walk now.